This "Historically Speaking" column was published in the Exeter News-Letter on Friday, October 26, 2018. Exeter students tasked with writing an essay or term paper about local history find three topics that most interest them – the Robinson Female Seminary, the Underground Railroad and Witchcraft trials. They arrive at the doors of the Exeter Historical Society eager to dig into the research, find some primary sources and perhaps tour the places in town that relate to their topic. Is it any wonder? All three are fascinating ideas. But, alas, although we have plenty of material about our all-girls high school, neither the Underground Railroad nor any witchcraft trials can be traced to Exeter. Nothing. Nada. The Underground Railroad simply didn’t pass through Exeter – in spite of some tales about houses with secret rooms or mysterious tunnels. Perhaps some fugitive slaves passed through town as stowaways on the Boston and Maine railroad but there was certainly no reason to stop overnight in Exeter. As noble as it would be to have been part of the Underground Railroad, it doesn’t appear to have been part of Exeter’s history. But why were there no witchcraft trials in Exeter? New England was a hotbed of such beliefs. There were a few local trials – including the most famous cases in Salem Village from 1692 – 93 – and nearly all locals have heard of Goody Cole of Hampton. John Putnam Demos in his 1982 study Entertaining Satan: Witchcraft and the Culture of Early New England, lists only ten witch accusations in New Hampshire between the years 1656 and 1697, all of which took place in either Hampton or Portsmouth. And of these, only six individuals were involved (Eunice Cole was put on trial three times and acquitted each time. Jane Walford and a woman named ‘Evans’ were each accused twice. It seems suspected witchcraft had a high recidivism rate). None of the New Hampshire women were executed for their crimes, in fact, only half even faced a trial. On the face of it, Exeter seems like the kind of place that would hold witchcraft trials. The town was settled by religious dissenters from the Massachusetts Bay Colony. Puritans who were too Puritan for the Puritans seem like just the kind of guys who would be into supernatural accusations. And yet, for all his ‘holier-than-thou’ preaching, the town’s founder, Reverend John Wheelwright, didn’t seem to comment much on the topic of witches. It’s not like he didn’t have much contact – William and Eunice Cole (“Goody Cole” if you use her married title) were in Exeter from 1638 until 1644. William signed the founding documents of Exeter – both the Wheelwright Deed and the Exeter Combination. But, like Wheelwright himself, the Coles left Exeter after only a few years. Those accused of witchcraft tended to be marginalized members of society – older women, impoverished or indigent, few family members, low social standing or having a long history of petty disputes with the group. In general, these were people well known to the community. Goody Cole became a minor celebrity for the accusations launched at her. There was no small amount of resentment that she frequently had to be supported by the town after her husband’s death and she was known to speak her mind on various issues. Women who speak their minds are nothing but trouble, it seems. It’s unlikely that Exeter didn’t have similar people in town. But we did have a very settled minister during much of the time period when witchcraft accusations cropped up in the surrounding towns. The Reverend Samuel Dudley served the Exeter congregation from 1650 until his death in 1683. During that time, Exeter’s major industry was lumber, which brought waves of itinerant and impious lumbermen to town. Dudley himself was described by Charles Bell as, “an important member of the civil community, an intelligent farmer, a considerable mill owner, a sound man of business, and the legal adviser and scrivener of the entire people. It is true that he always had a sharp eye to his own advantage, but he had a large family to provide for, and he was never accused of wrong or dishonesty.” He had enough work just keeping the core population of Exeter in God’s eyes with a steady stream of rowdy “others” circulating among them. Finding Satan’s foot soldiers in such an environment didn’t require townsfolk to turn on the outspoken midwife with a bad hip. More likely, it was a drunken day laborer or sailor from Portsmouth or who-knows-where who crossed paths with your pregnant cow. Put your mind to God, your back to work and next year the cow might produce a healthy calf. Demos posits that witch hunts surged when communities were in times of crisis due to politics, faith or disease. Exeter certainly experienced all of these during this time frame, but the steady guidance of the town’s religious and civil leadership may have been enough to avoid the divisive scapegoating that was the result of the New England witch hunts. 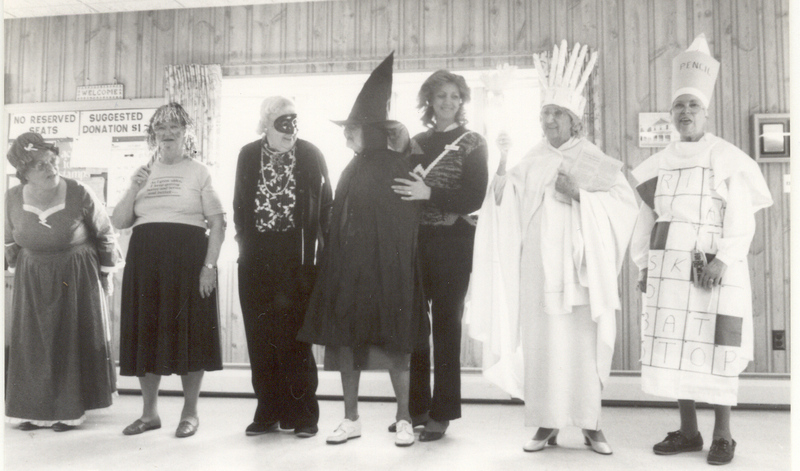 Photo: Revelers at the Exeter Senior Center in 1986 seem to be holding a witchcraft trial (or perhaps a costume contest). Although Exeter seems to be a quintessential New England town, there were never any actual witchcraft trials held here in colonial times.